The Raspberry Pi 2, Model B delivers 6 times the processing capacity of previous models. 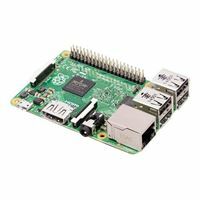 This second generation Raspberry Pi has an upgraded Broadcom BCM2836 processor, which is a powerful ARM Cortex-A7 based quad-core processor that runs at 900MHz. The board also features an increase in memory capacity to 1Gbyte. 3.3" x 2.2" x 0.6"